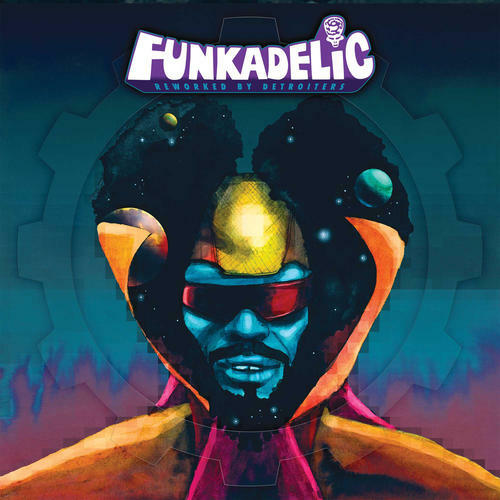 (3-LP set) Funkadelic were the most influential group to emerge from Detroit in the 1970s. Their early albums have cast a long shadow over everything that came afterwards in the city. From the techno pioneered by the likes of Carl Craig and Underground Resistance, to the garage rock revival spearheaded by the White Stripes and the Dirtbombs, all have paid homage to the Parliafunkadelicment Thang. The very finest talent now active in Detroit appear on the record, being given free rein to work on the multi-track tapes, to rework in any way they see fit. We have full-on remixes, futuristic creations using the original track as an inspiration, disco-fied re-edits and skeletal dubs. Spearheaded by Brendan Gillen of Interdimensional Transmissions, the set features names working across the musical spectrum. There is an appearance by those most mysterious of techno pioneers Underground Resistance, and by Kenny Dixon Jr. and his alter-ego Moodymann. The Dirtbombs throw down a frenetic take on 'Super Stupid', whilst disco re-edit expert Gaye Marvine adds his magic to 'Undisco Kidd'. Other contributors include Funkadelic alumni Amp Fiddler, Marcellus Pittman and Anthony Shake Shakir.